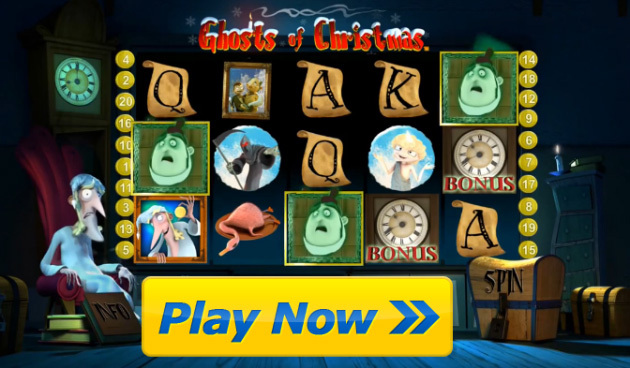 Ghosts of Christmas FREE Online Pokies Game - Have a Burl ! With Ghosts of Christmas, players will enjoy a well designed Christmas themed pokies machine from Playtech. The game starts with an awesome 3D animated introduction and players will surely begin to enjoy the Christmas Cheer. Played on 20 paylines, the game can be played for small and large bet amounts and all will enjoy seeing familiar characters on the reels. With Ghosts of Christmas, Scrooge fans will be enthralled and the payouts can be impressive when placing real money bets on the game. The graphics in the game are all stunning and appear vividly on the reels. The characters seen in the game include the ghosts of past, present and future. One will also enjoy the appearance of Tiny Tim as well as Bob Kratchet. The symbols of high value playing cards are also use to help complete winning combinations. To enhance the game, there are special symbols used to trigger game bonuses. Overall, the graphics are amazing and breath taking and surely add to the amazing visual appeal of the game. Those that are betting real money will be pleased with the various betting options that are supported. The game is classified as a penny pokie, so a mere bet of $0.20 will get things rolling. However, Playtech understands that all players have different betting preferences, so the coin denominations can be altered to suit different budgets. The maximum bet that can be placed is worth $1000 per spin, so the various betting amounts will appeal to any real money player. With this well designed Christmas pokie, players will benefit from a scatter and a wild symbol. The scatter can award instant payouts when two or more appear anywhere on the reels, but by spinning three or more, the free spin round will begin. The number of free spins will be determined by clicking on an icon. All free spins will offer triple payouts when winning combinations are created. There is also a bonus game offered, which is triggered with three clock icons on an active payline. At this time, the screen will change and present a scene that is selected at random from the Past, Present or Future. The number of bonus symbols that appeared to trigger the feature will determine how many selections can be made. Each pick will offer an instant payout of credits. 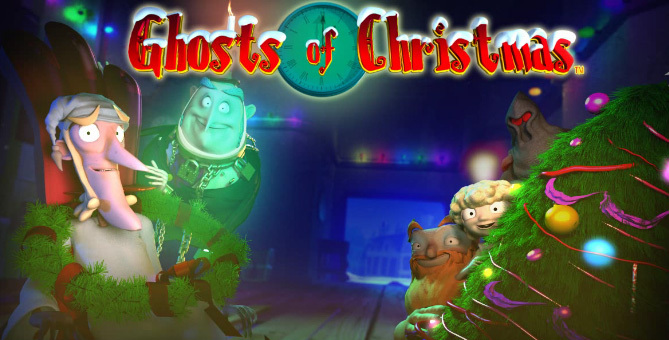 Ghosts of Christmas free pokies is one of the more thrilling themed games from Playtech and it is definitely an entertaining selection. With awesome betting limits and huge payouts in the base game as well as in the bonus rounds, this game is a huge hit during the holiday season. It can also be enjoyed for free to offer a festive experience to any player looking to enjoy an appealing and fun Christmas slot from a leading software developer. Google + Profile: Tina Lim on December 13, 2014. on March 5, 2016.